Curious about the new signs posted in the Cumberland Community Forest? Following is some history of the Forest and how to care for this community resource! The United Riders of Cumberland has worked hard to ensure that they can set an example to the community as to how we can dictate the future growth of the community and it’s recreational possibilities. In cooperation with The Cumberland Community Forest Society (CCFS), CUE Event Design & Management is proud to coordinate the Valley’s second annual Bike ‘n’ Bitz bicycle sale and swap with 10% of all sales going to the CCFS! Cumberland has been the recent site of much forestry harvesting, and with this is need to rebuild. Two local groups have now joined force to create the United Riders of Cumberland Trail Maintenance Days. 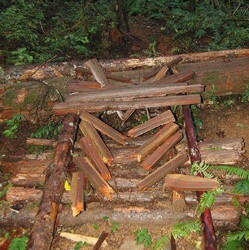 Marcel Tetrault, Comox Valley Echo Published: Friday, February 19, 2010 Malicious destruction in Cumberland’s community forest has people used to seeing brown and green seeing red instead. Thanks to Mother Nature many Cumberland Trails are now clear of snow! Wet but very rideable. Get out and enjoy. Just completed some updates and have uploaded new versions of the Cumberland and Forbidden zoomify trail maps. Find new copies of the map for sale at local bike shops shortly. Minor updates include new trails on Forbidden Plateau, notations of recent logging and a few new trails in Cumberland.